​Stay up-to-date on all our events! Sign up here to receive our monthly newsletter. 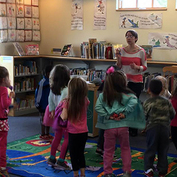 Drop-In storytime is for children ages 2 to 5 and includes stories, songs, rhymes, movements, and a craft all designed to help your toddlers learn and grow. If you and your child are new to storytime, please see our Storytime Guidelines. Designed for babies and toddlers up to 24 months, Lapsits are a great chance for you to bond with your child while learning new rhymes and stories to share. Each program includes stretches, music, a story, and more. 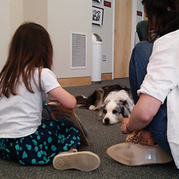 Readers of all ages get a chance to read to one or more therapy dogs to develop their literacy skills as well as build confidence and self-esteem in reading aloud or presenting. This program provides a supportive environment to practice reading aloud. 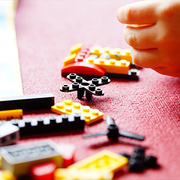 Build LEGO creations to a theme! Grades K - 5 are welcome to come and build with the library LEGOs. Build LEGO creations to a theme! Grades K - 5 are welcome to come and build with the library LEGOs and then have their creation placed on display for the entire month! Early to late elementary students get a chance to explore a new topic through hands-on learning. Our previous themes have included creating no-sew plushies, painting with watercolors, and even building an active "volcano" with kitchen supplies. Check our calendar for each month's theme! Teens (grades 6-12) can use this after-school time as an outlet for creative expression. We paint, cut, glue, craft, and (sometimes) get messy! Each month features a unique creation teens may take home.